As we’ve discussed before, Birmingham has a poor record of supporting public art. 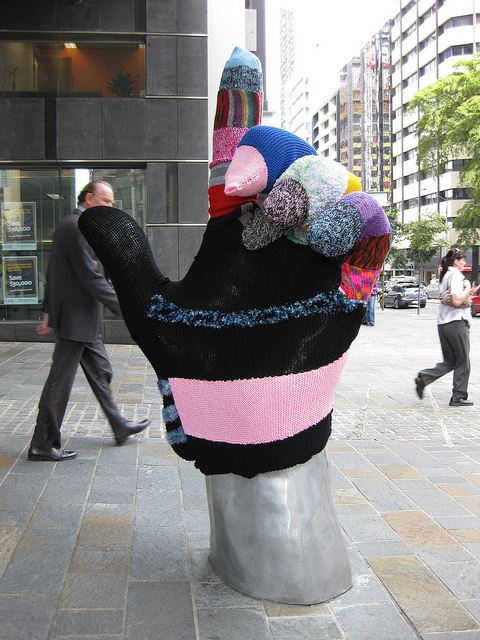 While other cities large and small use public art as a routine component of urban revitalization, we have no comparable strategic program here (pictured above is “Chat” in downtown Brisbane, Australia by the sculptor Sebastian di Mauro; the whimsical knit bombing is by others). The absence of a good public art program is ironic given the local artistic talent that the City has, as well as the ability of institutions like UAB and the Birmingham Museum of Art to attract all sorts of international talent to their stages and walls on a regular basis. 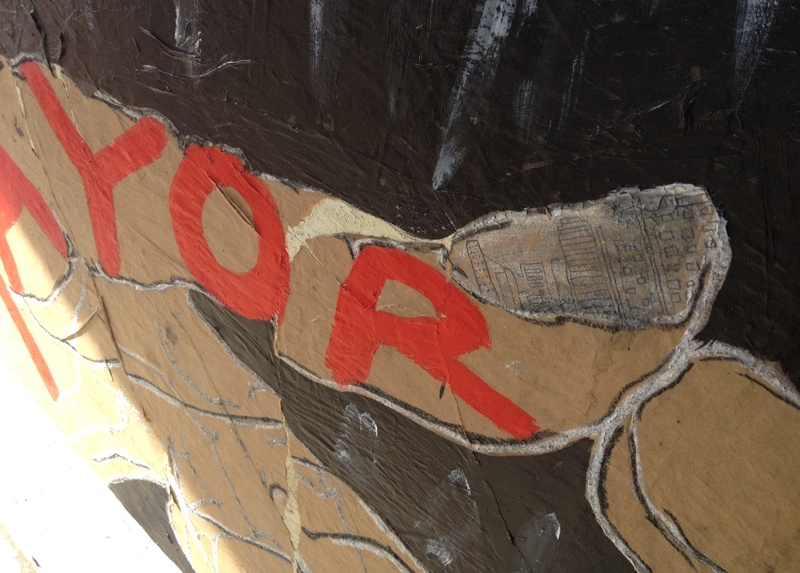 One of our readers alerted us last week to the public art project (above) at the base of the Brown Marx Building. For several years ugly, protective scaffolding has been erected around this large, historic vacant building at the corner of First Avenue North and 20th Street (several plans for mixed-use conversion over recent years have fallen through). 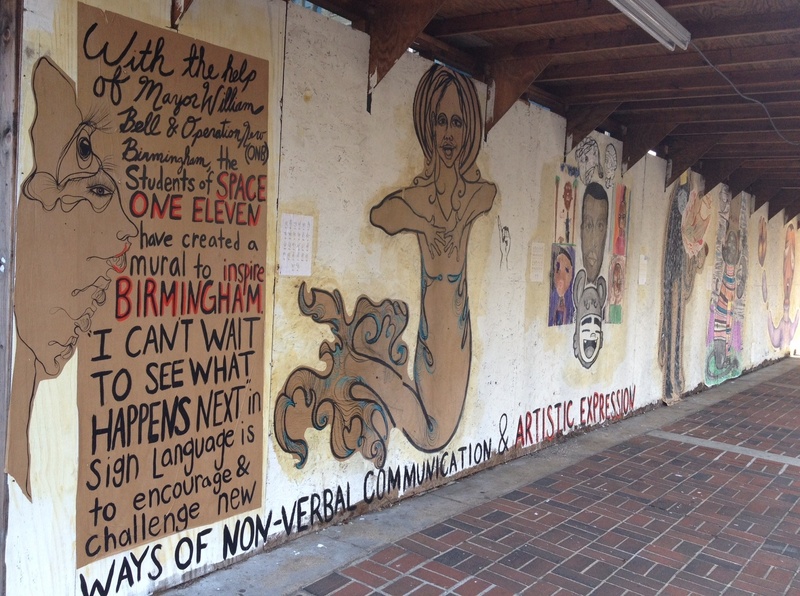 Art students with local visual arts non-profit Space One Eleven were sponsored by the City and Operation New Birmingham to create art across the long expanses of plywood. It’s low on budget but high on creative energy. Particularly satisfying was the portrait of Mayor Bell (detail, above), whose fingernail reflects an image of the downtown skyline. We love that. For a major building to present such a forlorn aspect to such an important public intersection is disheartening. The art project goes some way to brightening this condition (and will soon by joined by a pilot project, also sponsored by the City and ONB, to install more art in vacant storefronts along 20th Street). Demonstrating the power of temporary public art is a good start towards implementing a permanent public art program in targeted areas of the City. That last image of the burger-for-the-soul brings us to a nice tangent–John’s City Diner (above), one of downtown’s oldest extant restaurants, and around the corner from the Brown Marx. The facade experienced an unfortunate renovation–guessing the early 1970’s–with tile and metal siding. Over the last weeks the owners have been partially renovating the frontage, revealing the beautiful art deco detailing still remaining at part of the top floor. Fingers crossed that the canopy and storefront can also be renovated. And that the iconic neon sign can remain lit for many more decades to come. This entry was posted in Uncategorized and tagged Brisbane Australia, Brown-Marx Building, Operation New Birmingham, public art, Space One Eleven. Bookmark the permalink. 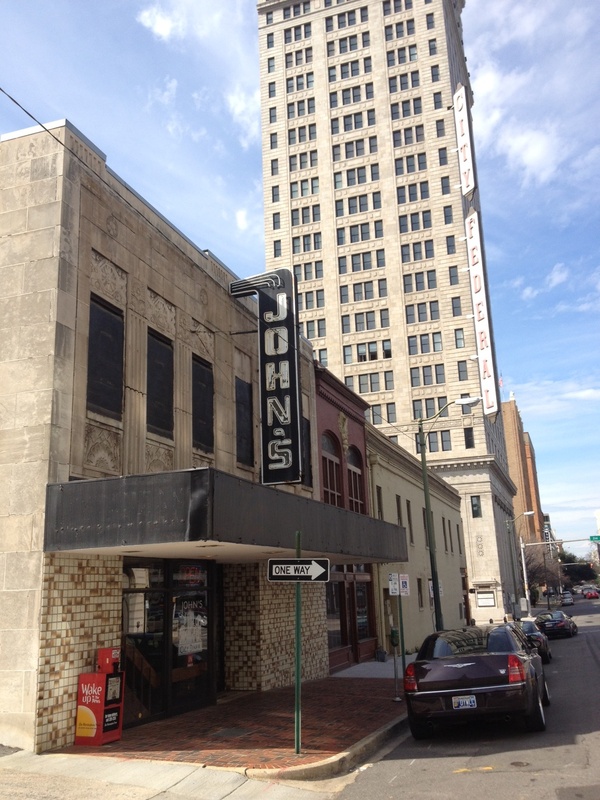 that awful John’s facade is from around 1978. People begged the owner not to do that to the interesting deco facade, telling him it was historic and so much better than what he planned. He said he was from Greece and he knew historic and that facade was not historic. I can still see the pic of him with his arms raised, palms up questioning what the historic society people were thinking. I believe the tile was attached in a way to allow it to be removed without too much damage. I am 99.5% sure that the limestone is still there. There have been 2 other buildings that had awful contraptions put on them that I had hoped one day to see restored. One was the Louis Saks specialty store that became Newberry’s. It was torn down for the Imax. The other was a delightful small Spanish style brick building at 4th avenue north (Zoes’) that was torn down for the new city deck You could still see much of the original facade by looking under the aluminum crap that was held out on rods. Thank you for this bit of history—peoples’ idea of “modernization” can be quite contradictory–especially in the 1970’s! It is a pleasure to see that original facade exposed. Wouldn’t take much to improve on that clunky canopy. So many of the buildings we love today have been re-exposed under federal tax credit restoration. Would be worth an exhibit to remind all how dumb it was. What an interesting–and sobering–exhibit that would be. Great article! Birmingham has such a wonderful creative culture but you don’t SEE it when you visit the city. We certainly could use more art projects that inspire our students AND our city to live up to its potential. Making that culture more visible–and a permanent part of the urban experience–is a worthy goal. Thanks for your comment. Anyone remember the mural program under Arrington? Very few are left, but they did brighten up the areas around them, although the remaining ones have faded badly. A lonely effort at the time. Thanks for reminding us about that–you are right, many are faded now. Public art should become enshrined as a matter of course here, rather than dependent on the interests of particular mayors. 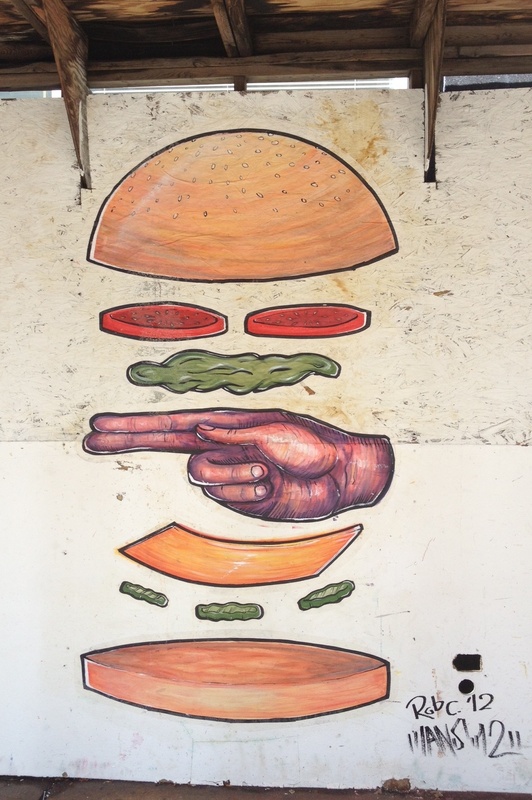 I love wheat paste! Looks like some talented artists are making beautiful things in Birmingham. I can spot my sister’s art from a mile away. Love it!